I used to spend a lot of my time in one of Dublin's piercing & tattoo studios. I had friends that worked there and knew the owner. I was friendly with a lot of that scene and as a result, knew a lot of heavily tattooed people. One day, while I was going through a relatively tough time, I was in the shop and saw a design I liked, I thought it humorous and cute. As the day went on, I thought about it more and more and decided I would get it tattooed on my forearm. 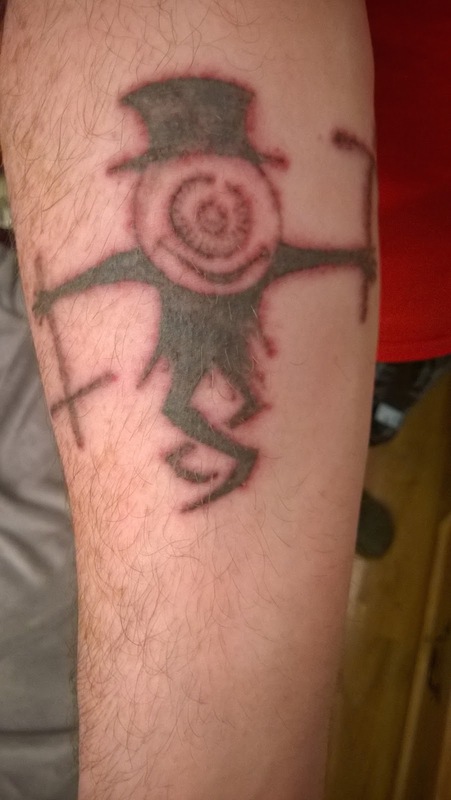 This was to be the first of many tattoos as I was going to add more. I was definitely going to progress to sleeves, maybe more. Later that day we started, as soon as the needle went in and I saw the first bit of ink, I thought "this is bad". The one piece of advice I'd give you is never get your first tattoo the same day you decide. Go home and think about it overnight. Ask the studio if they'll do a transfer, so you can see how it looks. Keep it for a night before going all in. So, about an hour later, the tattoo was finished. It should have cost me €100 but as I knew the owner of the studio, they did it for €80. The same night, I got a phone call from the friend whose birthday it was telling me that his dad had died. This has always given me a sentimental attachment to the tattoo that I would not have otherwise had. I couldn't find an old photo of it anywhere, I guess I never really took pictures of myself, I'm pre-selfie generation. The one below is taken the day of my first session (I know, I've ruined the suspense). It's swollen here so hard to get a proper idea of how it looked but it shows the colour. You can't properly tell how dark it was though.